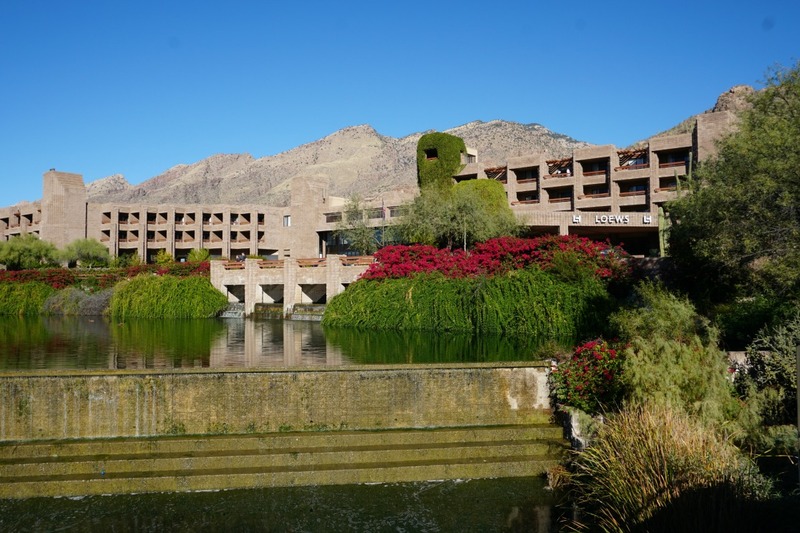 Are you looking for family fun in Tucson, Arizona that is rich in history? There are several attractions that have historical significance in the town known as The Old Pueblo. One place that is a sentimental favorite is Old Tucson Studios. 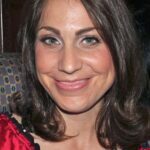 Multidimensional TravelingMom Kristi Mehes recently spent a day at Old Tucson Studios with her family, including her 4 year old son. There is plenty of fun to be had for the entire family at Old Tucson Studios. Old Tucson Studios has plenty to offer for those looking for family fun in Tucson, Arizona. Photo by Multidimensional TravelingMom, Kristi Mehes. 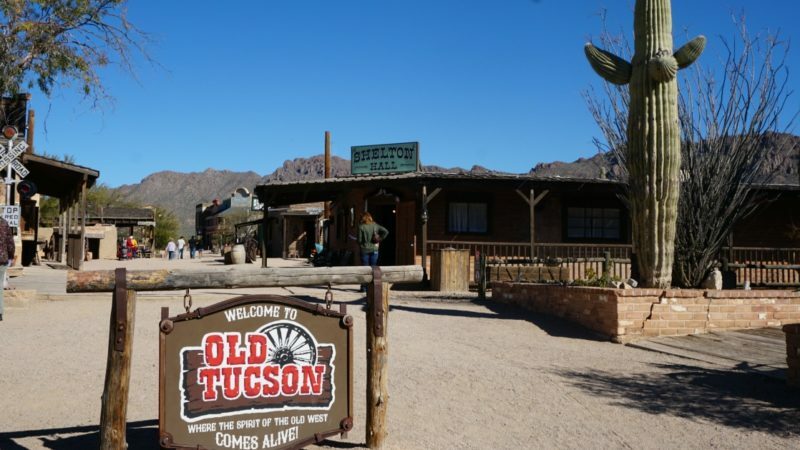 Old Tucson Studios is a movie studio where several famous western movies and television series were filmed. However, it’s not just a movie studio. There are several things to do for family members of all ages. 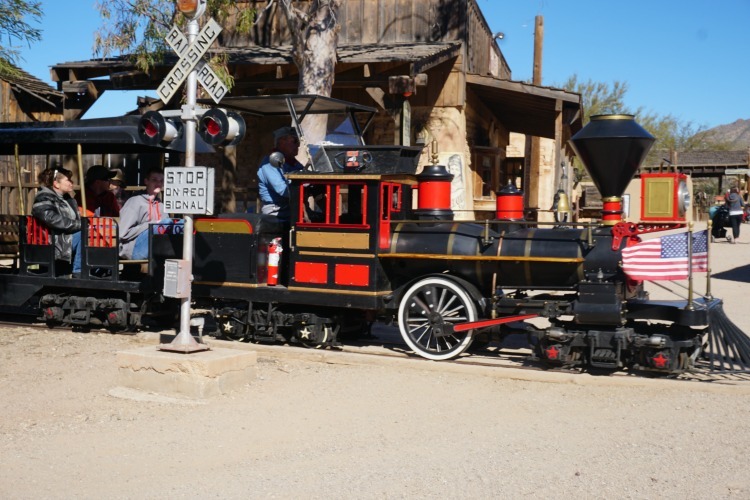 From a carousel, to vintage cars, to a train, to a western stagecoach and more, there’s plenty of family fun in Tucson, Arizona at Old Tucson Studios. Old Tucson Studios was originally built in 1939 as a set for the movie Arizona, starring Jean Arthur and William Holden. Visiting Old Tucson Studios really is like taking a step back in time. 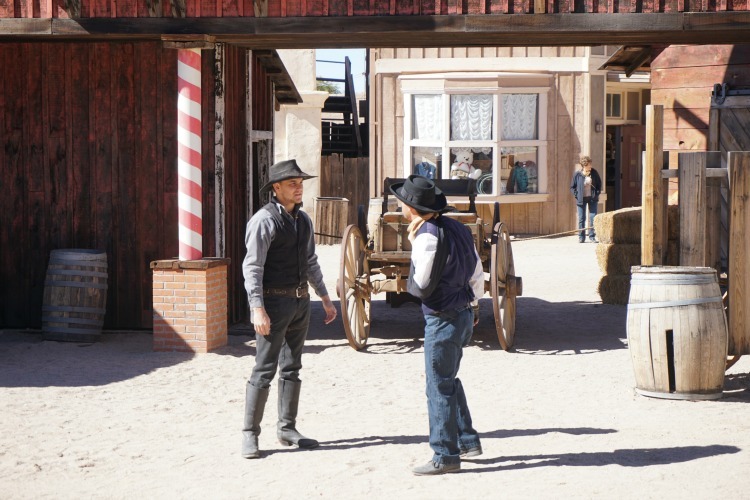 A portion of the movie Tombstone, starring Val Kilmer and Kurt Russell, was filmed at Old Tucson Studios. Other western classics like The Three Amigos, Rio Bravo, and Gunfight at the OK Corral were also filmed at Old Tucson Studios along with TV series like High Chaparral. 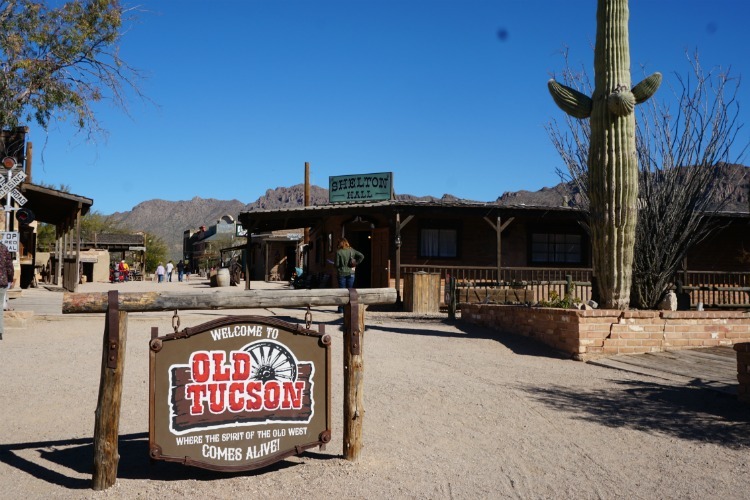 While the western movie fan will enjoy experiencing Old Tucson Studios for its historical significance, younger children will enjoy the fun western sets. 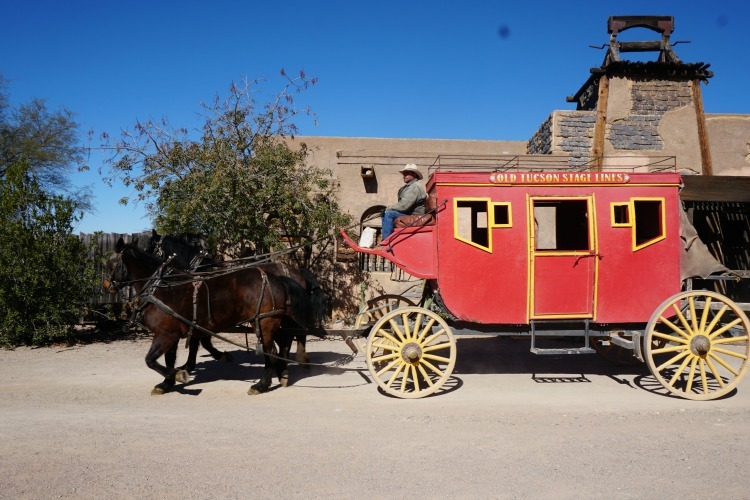 One of the fun things to do as a family at Old Tucson Studios is ride the western stagecoach. Tickets to ride the stagecoach are not included in the general price of admission, but it is worth it for the experience. One of the guides told us beforehand it took four days just to get from Tucson to Phoenix in a western stagecoach. Passengers also slept overnight in the stagecoach. It’s a completely different experience now. Imagine that an hour and a half drive to Phoenix in a car lasted 4 days in a stagecoach! Riding the western stagecoach at Old Tucson Studios is also another way to experience family fun in Tucson. Photo by Multidimensional TravelingMom, Kristi Mehes. There are several entertaining stunt shows at different locations throughout the day at Old Tucson Studios. The times are listed in a handout as you enter the park. One of the stunt shows that is a crowd pleaser is the western shootout. Some of the cowboys are also available for photographs. It was, without a doubt, the highlight of my 4 year old son’s visit. There’s also entertaining stunt shows at Old Tucson Studios. Photo by Multidimensional TravelingMom, Kristi Mehes. Old Tucson has vintage cars that adults and children over a certain height can drive. Both my husband and I took turns driving our son around the track. The desert landscape surrounds the well-maintained driving track. 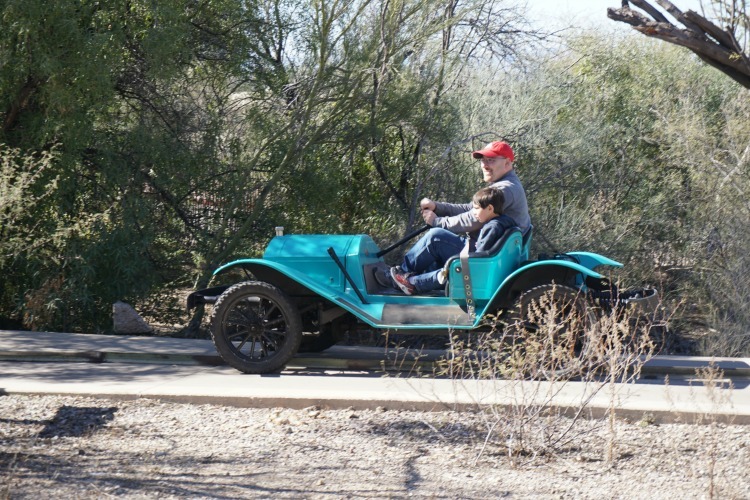 The vintage cars at Old Tucson Studios also provide family fun in Tucson. Photo by Multidimensional TravelingMom, Kristi Mehes. Not included in the admission price, panning for gold is a fun add-on available at an additional cost. My son really enjoyed panning for gold and was extremely excited when he found “gold.” It does require some degree of patience, though. Included in the price of admission, the train at Old Tucson Studios is fun for all family members. Because my family loves trains, we not only started our day on the train, but also ended our day there, too. The train ride loops around Old Tucson, taking passengers past many of the different movie sets. It’s also a great way to get an idea of the general layout of Old Tucson Studios. All aboard! The train is fun for both adults and children. Photo by Multidimensional TravelingMom, Kristi Mehes. You’ll find a carousel located near the train station. Because it’s close to the train station, it makes it very convenient for families to travel back and forth. The carousel features beautiful traditional horses as well as benches for those who don’t like to go up and down. Like the train and the vintage cars, this is a ride that both adults and children can enjoy. Looking for places to visit to experience family fun in Tucson, Arizona? Old Tucson Studios has plenty of things to offer for all family members. Thank you for the great article–you always do such a nice job. A great comprehensive look at Old Tucson that covers some of the best part of us. BTW, kids 11 and under get in free all weekend long, July 1- 4, and there will be lots of games, prizes, pie-eating contests and more. Hope families will come out and celebrate America’s birthday–Old West style! Undoubtedly you give new ideas . to day trip families in Arizona—-and a reason . to stay longer for visitor from afar.